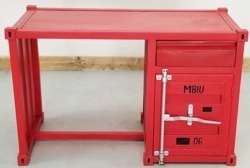 Here's the industrial touch you're looking for in your office, this maritime-looking work desk will take you on a creative journey with a drawer and a secure storage cabinet underneath. We offer 'Senor' Desk from Inspace India. We are involved in offering an entire gamut of Office Table. Our range is very comfortable and durable and also appreciated for its perfect and trendy designs. These table are manufactured with high grade raw material and ensure optimum quality at our vendors end. Our clients can avail these tables from us at very reasonable rates. Keeping in mind the changing requirements of our clients, we are offering an optimum quality array of Executive Office Desk. Adhering to the zealous dedication which we have been able to procure in this market economy, our firm offer a best class of Managing Director Table.